In the Unofficial Championship, Zhu eliminates Ponomariov!! In an Unofficial World Championship, Zhu eliminates Ponomariov!! The world of chess just got a bit more complicated. 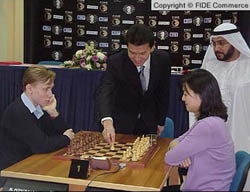 In the ongoing 2002 Dubai Open, the first-round drew a very interesting matchup: China's Zhu Chen vs. Ukraine's Ruslan Ponomariov. It is a bit of intrigue since both are reigning Women's and Men's World Champions, respectively. So… woman vs. man. Who would get the FIDE bragging rights?? Zhu Chen!! Perhaps this puts the idea of the world's legitimate champion into further question. Ponomariov just came off of a successful showing at Linares, placing clear second while removing doubts that he belonged among the elite players of chessdom. While it should not come as a huge surprise that GM Zhu Chen has dished out many beatings, it was a surprise that she defeated the 18-year old champion who has such momentum. Perhaps this puts the final nail on the coffin that women can't compete on high levels with men. GM Judit Polgar had long ago destroyed this notion as she ate male GMs for lunch, destroying many (2600-2700 GMs) in less than 30 moves, or mating their faces with vicious kingside attacks. Alas, perceptions of female inferiority still exist. It appears that the Hungarian and Chinese women have done much to vault women onto the world stage on equal par with men. So next time you face a nice-looking woman in a tournament, don't become enthralled… roll up your sleeves and get ready for a fight! She's probably quite dangerous!